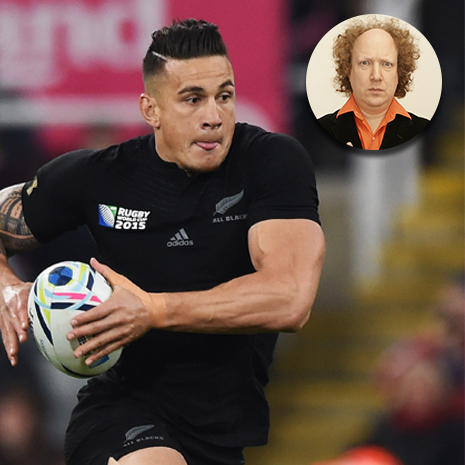 The battle on the pitches at the Rugby World Cup won’t be the only war raging through September and October. While mostly symbolic for fans, jerseys play a role in a team’s performance and even the mindset of the players (For better or worse). Years of secret research and development goes into the technology inside the players shirts. Great expense is spent in the modern game to give the team any edge over the opposition possible, as technology advances these edges become harder and harder to find. The last giant leap in technology in rugby shirts was wearing body tight jerseys and since then technological improvements have been more incremental. The design is also a painstakingly long process (which means when it goes wrong it’s all the funnier) from concept to finished product. Whether you want to know more about what you’re team is playing in for the biggest rugby tournament in the world or are considering wearing a test jersey for playing or training purposes, here we’ll highlight the key features in the shirts of the leading manufacturers in this war. adidas have become a dominant brand in professional rugby. They are to boots what Gilbert are to balls and there are no signs of them stopping. The teams and nations they sponsor are iconic and adidas have done a great job creating iconic shirts for those teams. There aren’t many shirts out there that boast space age technology but adidas have looked to the stars for help with their shirts. Using a process called ‘Dynamic Stretch Analysis‘, usually reserved for air and space craft, adidas created shirts that worked in harmony with the way the players skin stretched and strained. While not tailored exactly for you like the players shirts, the test jersey available at rugbystore.co.uk, provides the player with the ultimate movement from a shirt that stretches with you. Combined with woven carbon, adidas have created a shirt that is extremely flexible and still tough enough to stand the rigours of the game. While the design remit for the All Blacks shirt might be one of the hardest in the rugby world, adidas have yet again come up with a great new design. Inspired by the 1905 Originals team, the 2015 All Blacks shirt features a pattern around the neck and shoulder area inspired by the leather yoke worn by the team over 100 years ago. The design could inspire success, the Originals won 34 of their 35 match tour, a record any team would be pleased to equal. 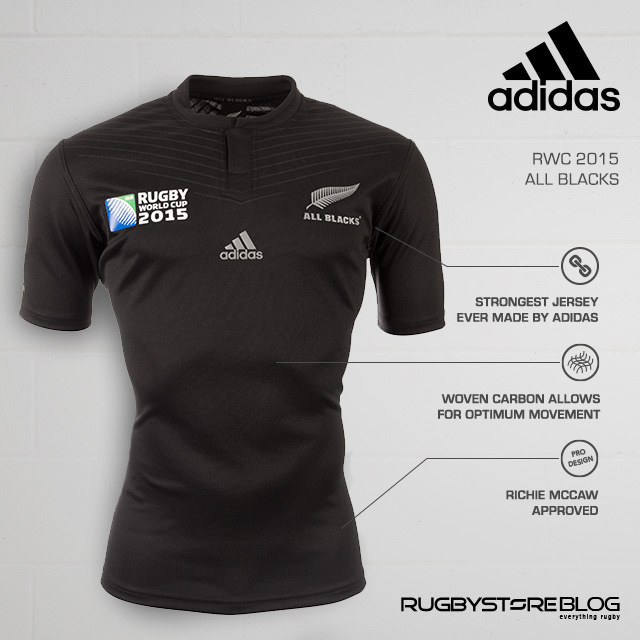 Key All Blacks players like Captain Richie McCaw were involved with the design and development of the shirt and even had to sign off on the final range. Another of the adidas designed shirts, Italy, also draws from it’s heritage. It’s pinstripe collar reflects the style that comes to mind when you think of Italy and stylish and inventive play is what the players will hope to create on the pitch. The manufacturer with the longest rugby pedigree in this list, Canterbury of New Zealand, have been making rugby kit for over a hundred years. Therefore, it’s not surprising that their shirts for this year’s Rugby World Cup, including the host nation’s shirt, is the most advanced kit they have made to date. Canterbury have also improved the contoured ball-deadening grip on the chest for improved ball carrying and ball retention. The body mapping in the limited elite shirt, means that once you pull it on, it will fit to your shape, meaning each of the limited 2,015 shirts (for England and Ireland) will be unique. We can’t wait to see how the shirts hold up on the pitch come September. 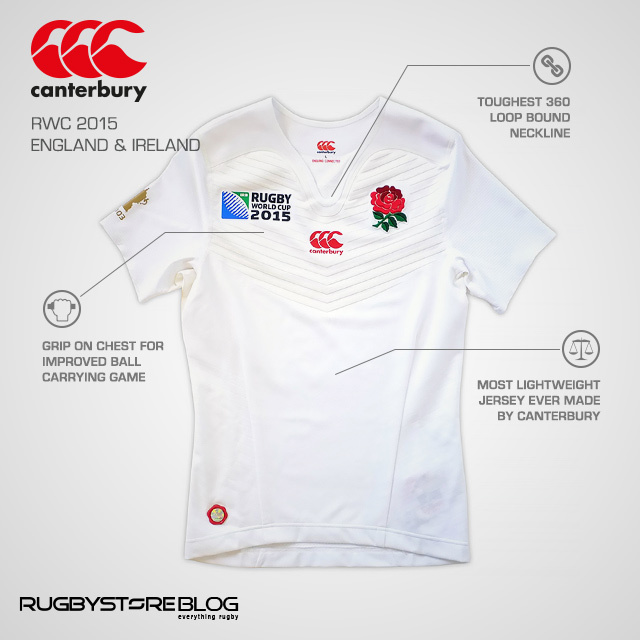 The Canterbury design team have gone for a simple and inspiring design on the England and Ireland jerseys. The proud one colour design of the home shirts are uncomplicated and patriotic, aiming to boost the pride of whoever pulls one on. Canterbury has also talked a lot about the 3D injection-moulded crests, which may seem like a small touch but are very striking when you see it in person. The newest of the three sportswear companies to the rugby scene on this list, ASICS have made up the ground quickly. Applying their expertise from athletics to rugby has resulted in some of the top performing boots and shirts in the rugby industry. Now, for their first Rugby World Cup, ASICS have utilised their Institute of Sport Science in Kobe, Japan, to create their most technologically advanced rugby shirts ever. ASICS have attempted to take on board what their Australian and South Africa players look for most in their kit when developing the shirts. By finding out what was key to the players on the pitch, they have attempted to solve any problems or difficulties they had experienced in the past. And through extensive testing, ASICS appear to have succeeded, although the real test will come in September. Grip on the chest area is also present on this jersey although it is lower here, for making ball retention easier and binding in the scrums more secure. The other smooth material on the shirt however is designed to be almost slippy to the touch, making tackles on the players harder. ASICS have also made the jersey as light as possible, which may not seem to important at first but over the course of 80 minutes, every gram helps. 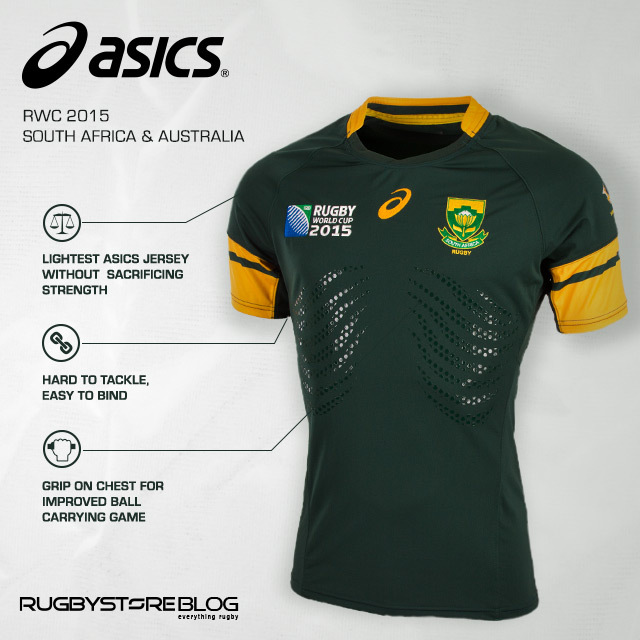 It is 70g lighter than the previous ASICS rugby shirts. Some of the extensive testing for the shirt can be seen in the video below, taken at the ASICS Institute of Sport Science in Kobe. ASICS have the difficult job of having the two teams that use the same colours but have created two slick looking shirts. Which one we’ll see make it further in the tournament we’ll have to wait and see. We know what shirt you wear most of the time comes down to who you support but what shirts have you been impressed by so far this summer? Let us know in the comments or over on Facebook or Twitter. What other technologies would you like to see developed in rugby? Find all the Rugby World Cup Replica Shirts.